Neognaths (Neognathae) are birds within the subclass Neornithes of the class Aves. The Neognathae include virtually all living birds; exceptions being their sister taxon (Palaeognathae), which contains the tinamous and the flightless ratites. There are nearly 10,000 species of neognaths. Since the late Cretaceous period, from which the earliest fossils are known, they have undergone adaptive radiation producing the diversity of form, function, and behavior that we see today. It includes the order Passeriformes (perching birds), the largest clade of land vertebrates, containing some 60% of living birds and being more than twice as speciose as rodents and about five times as speciose as Chiroptera (bats), which are the largest clades of mammals. There are also some very small orders, usually birds of very unclear relationships like the puzzling hoatzin. The neognaths have fused metacarpals, an elongate third finger, and 13 or fewer vertebrae. They differ from the Palaeognathae in features like the structure of their jawbones. "Neognathae" means "new jaws", but it seems that the supposedly "more ancient" paleognath jaws are among the few apomorphic (more derived) features of this group as compared to the neognaths. The Neognathae were long ranked as a superorder and not subdivided any further. Attempts to do so, as in the Conspectus of Charles Lucien Bonaparte, were never accepted by a significant majority of ornithologists. Until the 1980s, there was little subdivision of the Aves in general, and even less of phylogenetic merit. Since then, the availability of massive amounts of new data from fossils (especially Enantiornithes and other Mesozoic birds) as well as molecular (DNA and protein) sequences allowed scientists to refine the classification. With new groups of neognath orders being verified, the taxonomic rank of the group needed to shift. Most researchers have now employed the unranked taxa of phylogenetic nomenclature. 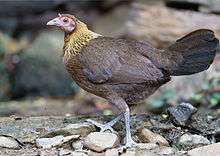 The Neognathae are universally accepted to subdivide into two lineages, the "fowl" clade Galloanseres and the Neoaves (sometimes called "higher neognaths"). The subdivisions of the latter are still not well resolved, but several monophyletic lineages have been proposed, such as the Mirandornithes, Cypselomorphae, Metaves, and Coronaves. Although groups such as the former two (uniting a few closely related orders) are robustly supported, this cannot be said for the Metaves and Coronaves division for which there is no material evidence at present, while the Mesozoic record of Neognathae is at present utterly devoid of birds that should have been present if these proposed clades were real. The orders are arranged in a sequence that attempts to follow the modern view on neognath phylogeny. It differs from the widely used Clements taxonomy as well as from the Sibley-Ahlquist taxonomy, combining those elements from each that more modern research agrees with while updating those that are refuted. Most of the changes affect those "higher landbirds" that are sometimes united as near passerines. Loss of the Basipterygoid articulation with the cranium. Development of a pterygoid/palatine joint. Reduction of the vomer, such that it does not reach caudally to the pterygoid, or is lost entirely. Neognathae phylogeny based on Jarvis, E.D. et al. (2014) with some clade names after Yury, T. et al. (2013). Wikimedia Commons has media related to Neognathae. Mindell, David P. & Brown, Joseph W. (2005): The Tree of Life Web Project - Neornithes. Version of 2005-DEC-14. Retrieved 2008-JAN-08. Mindell, David P.; Brown, Joseph W. & Harshman, John (2005): The Tree of Life Web Project - Neoaves. Version of 2005-DEC-14. Retrieved 2008-JAN-08.